When it comes to matters of family law—divorce, custody and property division, to name a few—finding the right attorney is critical. The right person, after all, can work toward achieving the best possible outcome in such a dispute, as well as help a client endure and then recover from the potentially devastating emotional rigors of a protracted divorce or custody battle. Attorney Jennifer Courtney, owner and founder of her firm The Law Offices of Jennifer Courtney, P.C. in Yardley, believes she is “the right person.” She has the legal skill and expertise, as well as the gift of perspective, to prove it. Courtney knows this from 22 years of practicing family law exclusively. Also, besides her years of experience in and out of the courtroom, she knows because she’s been through divorce herself. Courtney is proof that life does go on in the aftermath of a divorce. Clients also appreciate the hands-on approach Courtney takes with all her cases. In this age of constant communication, she believes there is no excuse for being inaccessible to a client. She’s certainly not the kind of attorney who doesn’t return calls or respond to an email. Courtney’s dedication to family law and commitment to legal excellence has propelled the success of her firm. Courtney has litigated thousands of divorce actions in her 22 years of practice and is admitted before the Supreme Courts of the United States, Pennsylvania and New Jersey. Another mark of honor is Courtney’s BV Distinguished Peer Rating from Martindale Hubbell, which she has held since 2006, attesting to Courtney’s excellent rating for her professional ethics and legal ability. 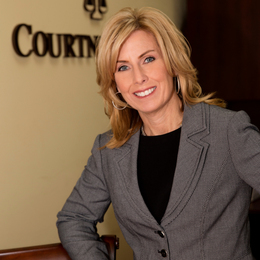 Courtney has also been recognized as a top attorney by Philadelphia magazine and is recognized as a top lawyer in many local publications year after year. Courtney, who earned her undergraduate degree from the University of Delaware and her law degree from Widener University School of Law (now Delaware Law School) is also an active member of the Pennsylvania Bar Association and Bucks County Bar Association and their family law divisions to stay abreast of her discipline. Courtney finds that one of the hardest aspects of divorce has to do with the loss or lack of control. Clients often describe feeling as though their life is spiraling out of control and they don’t know what to do to regain their bearings. By involving clients in their respective cases and advising them on their options, Courtney helps to return some of that sense of control over their life so they can begin to think about their future, after the proverbial dust has settled. Courtney knows that each case is unique, and she treats it as such. She commits to providing all clients with sound, sensitive advice rooted in trust, all designed to enable them make decisions that can help them get back on their feet, not only financially but also emotionally. As someone who practices family law on an exclusive basis, she realizes she is something of a rarity in her field. “Family law isn’t for everyone,” she says. “You’re not only the messenger of a lot of unwanted news, but you’re there during someone’s toughest time. That’s why trust is so important. I take the trusting relationship that I build with my clients as both a responsibility and a privilege. In an area of the law known for taking a toll on the attorneys who practice it, Courtney feels sustained—even inspired—by the relationships she forges with clients. She admits that family law can, at times, be draining, but the resolution she helps clients attain is well worth the wear-and-tear that stems from the demanding nature of the job. “I really do view my role as a privilege,” Courtney reiterates. “I’m constantly driven by the clients who come back and tell me I was there for them when nobody else was, or that I ‘was their legal rock.’ That keeps me going. I see it as an honor to lead them through these difficult times and help prepare them for their next phase of life. So often they come back and I see that transformation and am proud to have led them along the journey from one chapter of life to another. The Law Office of Jennifer Courtney, P.C.